Explore the underground corridors of the Museum and visit some of the reserve spaces where more than 65,000 collection objectives have been classified: insects, mammals and many others. The Museum and building histories as well as the archeological display of the region will also be presented to you. Continue your visit to the production workshop where all the exhibitions are produced by the Museum. Plunge into the heart of a fantastic universe where you will exchange stares with hundreds of other animals presented in both an unexpected as well as scientific way. The AlterAnima exhibition presents the most attractive of the naturalised collections in the Museum, in an artistic and original backdrop. Hundreds of specimens await you, including a polar bear and a cougar. You must remain alert however and open your eyes wide because many of the animals are hidden in unexpected places. 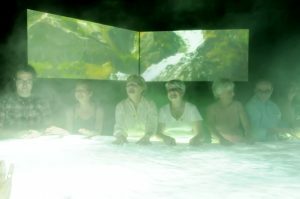 Come and enjoy this unique multimedia and multisensory adventure. Cast yourself back to an earlier time when the Appalchian mountains were being formed, live the tumultuous period of the continental drifts, cross over lava flows as they merge, witness the creation of the lakes and rivers that dot the Sherbrooke landscape, sense the separation of the continents and even the deglaciation period, all without ever leaving the museum. You will never look at the Eastern Townships in the same way again. Our timetables and rates are subject to change without prior notice. The timetable of special activities can be modified and the events cancelled because of climatic conditions or technical problems. All rates are quoted in Canadian currency. If you cancel one of your reservations less than a week prior to the date of the activity, we will be obliged to invoice you the minimum rate.